There’s nothing quite like kicking off the week strongly. The Lürssen team may especially agree today, considering it floated the megayacht Tis out of her build shed this morning. And yes, Tis is indeed her name, shining from her nameboards. Standing six decks high, accentuated by a blue hull and, unexpectedly, blue detailing on her aft upper decks, Tis is among the largest megayachts planned for delivery this year. Measuring 364 feet (111 meters), she bears styling as well as interior design by Winch Design. 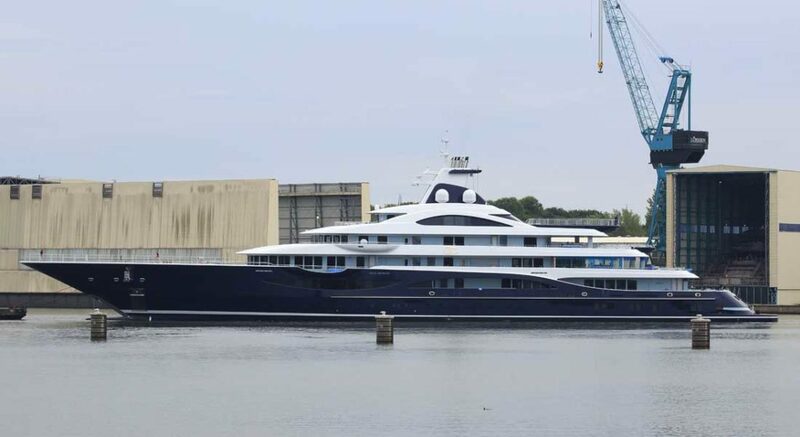 The partly finished, then-called Project Tis initially launched in October 2016, moving from one shed to another at Lürssen’s facility in Rendsburg, Germany. While that move understandably caught yacht spotters’ attention, another fact was more noteworthy. The shipyard revealed that the project made the move just 11 months after her keel laying took place. Given her LOA, it’s was a pretty quick time frame. While Lürssen further revealed the megayacht’s broad beam of 55 feet (16.85 meters) at that time, it’s kept additional specifics quiet. Judging from the nearly completed yacht, however, some things are or seem certain. For example, fixed balconies are aboard. Note the pronounced extension forward on the main deck. It appears to additionally feature glass inserts. More glass inserts ring an alfresco observation area/lounging spot two decks up. Between these decks, meanwhile, another extension likely denotes a wing station. Fully aft on that same deck, a set of handrails flanks what may be either a hot tub or a pool. Finally, down by the transom, a set of four ports could signify a beach club. Lürssen does say that Tis will entertain her guests in grand style. In addition, she will treat them to “generous” headroom. Perhaps the owner will permit a few explanation about that grand scale and the passenger capacity for publicity in the weeks to come.